When we last spoke to Evan Smith, he had given us some insight into his time as a cast member on the first season of Temptation Island as well as his strong connection with Morgan Lolar, one of the singles on the show. What we couldn’t tell you then is that we spoke to both Evan and Morgan, and they spilled the beans to us about their surprise engagement! Find out everything Evan couldn’t say and more in our follow-up celebrity interview below. 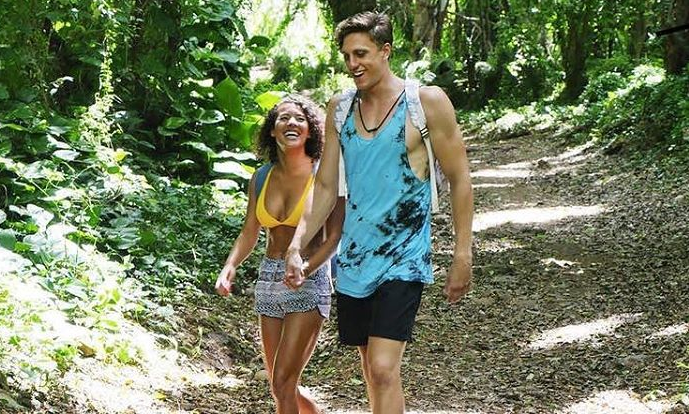 We got the scoop from Evan on his life after the show, his proposal to Morgan, and what their future wedding and living plans look like. 1. You can finally share the news that you and Morgan are engaged! What does that feel like? Yes! I am so happy that I can talk freely about it. I am so pumped. I am so happy I get to be out in the open with all of it. 2. Can you walk me through the show ending? After the show wrapped, we stayed together in Hawaii for three or four extra days with no cameras. We wanted to enjoy the island, and be together and be ourselves. We then flew to L.A. and spent about three to four days in L.A., too. Then, I went to my apartment, I grabbed my stuff, and then flew to Arlington and Morgan and I have been together every day since. 3. Tell us about Kaci. What happened there? How did you break the news to her? So on the finale, we were given the choice to stay with the person we came with, leave single, or leave with another person. Kaci made the decision that she wanted to leave with me, and my decision was that there was no way that I was ever going to leave that island without Morgan. So, the news was broke to her there, and then when I got back to L.A., Morgan and I spent a few days together and then she jetted to Arlington and the next day I caught my flight to Virginia as well. Kaci and I had a conversation in our apartment. We talked about her side of the island, my side of the island, what went down editing wise. I told her that I really love Morgan and I have fallen hard for her. I told her that I wish nothing but the best for her. 4. The way you feel about Morgan, did you feel like that about Kaci in the beginning? I have learned a lot about myself on this island. I learned that there is a difference between being in love and being comfortable with someone you have known so long. It is a huge difference and I finally figured out the difference. You need someone in this life to balance you out. I am passionate and emotional and Morgan is more serious. We balance each other well and I needed that so badly in my life. She truly is my other half that I’ve been looking for. 5. Clearly, there are other families involved when you’re in a relationship for a long time. Did you speak to Kaci’s family at all? It was tough. When you’ve been together for so long, families are involved.To be completely frank, I was never that close with Kaci’s family even though they lived so close. We maybe hung out 15 times in the past five years being together. In contrast, I am with Morgan’s mom and dad twice a week no matter what. Whether it’s watching a basketball game, or going to get some beers on Taco Tuesday or playing Dominoes. So, its very different. I have had no conversations with Kaci’s family. I think we are both grown. We are approaching 30. I love family, but I think with a break-up like that, I think it is better for it just to be between the significant others. 6. Can you tell us about Morgan’s family? I love this family. It is my family now too. I wish that you got to see that. I don’t have any father figures both my grandfather’s are dead and I lost my dad the way I did. Morgan brought me to tears on the island because she looked me dead in the eye and told me, “I will share my dad with you.”I broke down. It is just a testament to show you what kind of girl Morgan is. She is a twin. She has shared her whole life and it is in her nature and her heart. 7. Can you walk us through the proposal and how that happened? Yes! I would love to do that. You are the first one that I can talk to about it! Morgan and I had spoken about getting married. To be completely honest, we talked about it, and I told her it would be around her birthday on May 2nd. When you know you know, and I never understood that phrase when I would hear it from people who had been married for 50 years. But, I know exactly what they are talking about and it is lightening in a bottle, just like Mark said. I’ve felt like this for so long, ever since we got back from the island. I had been having dreams of Morgan in a white dress, walking down the aisle, and I just thought I don’t want to wait any longer. I want to make this happen. I just had to do it. So, we were getting ready for the six month home packages that they were about to film and I talked to production and basically told them that I was in love with this girl and there was no way I was spending any more of my days without her. So, I would love to propose to her on the comebacks. Production loved the idea. So, I was trying the whole week to get away from Morgan because we spend all of our time together, and I was trying to shake her, so I could talk to her dad for his blessing. The night before I proposed, I finally shook her, and I drove to her father Dave and sat down and told him ‘I want to have a conversation with you. ‘I can’t imagine life without Morgan. I love her with all of my heart and soul, and I promise to take care of her, and I need your blessing to marry her. He’s a very loving man, even though he doesn’t show it that much, and he looked me in the eye, and said he loved me and that I am part of this family now and it was amazing (You could hear Evan crying in the background). The whole day was magical. We did a shoot at the National Mall and then we sat down at the dinner and I was so nervous but so happy and excited. It was amazing. I told her that I spoke to her father and in this conversation I had with him, he gave me his blessing to marry her and she just started ugly crying. So, I got down on one knee and told her, ‘I can’t imagine not spending every single day with you forever and always. Will you make me the luckiest man alive and marry me?’ She said yes, and it’s been amazing every day. 8. So, Kaci knows you’re engaged now. Did she have any reaction to this? I don’t know. I have had zero communication with Kaci. I think it is better that way. I know that she has been saying things on social media. I have just been quiet on my end. I am happy. I am living in the now and cannot wait to just move forward. 9. Are you and Morgan planning on making D.C./Arlington your home? We talked about it. This is my first winter out here on the East Coast. It was very different walking Ghost (Evan’s dog) in the snow versus my 77 degree weather in L.A.. We are going to spend the summer here in D.C and after we will probably be moving to the West Coast. She has ties to Arizona because she grew up there, and I’m an L.A. boy, born and raised. So, we are probably going to make the push out to L.A. in the fall, but we have to figure out a few things before that. 9. Do you have any dates or locations in mind for your wedding? 10. Are you guys thinking about starting a family right away? We have definitely talked about it. We both want children. We don’t want them in the far off future. We want them kinda soon, but it would never be before we are married or anything like that, but we want to start a family. I can’t imagine a better partner. There’s nobody better than Morgan and I’m just so lucky and so blessed to have her in my life. 11. So, this is really it for you? There are no doubts? It is not a rebound? Sounds like you found it. Yes, I found it. It’s so funny because I talked about why I haven’t been able to get down on one knee for Kaci, and there was always something in the back of my head saying it’s just not right. It is not it. The reason why it wasn’t it was because I was still waiting for my soul mate. All those trials and tribulations I was going through in that relationship, brought me to that island and the stars had to align for both of us to be on that island at the same time. It’s so magical, and I understand how blessed I am. I wake up every morning and count my blessings with her. It’s incredible, and everyday with this girl is incredible. I know it sounds so sappy, but it is real. When you know, you know, and I’ve never been so happy in my entire life. Want to keep up with Evan and Morgan? You can follow Evan on Twitter and Instagram. You can also follow Morgan on Twitter and Instagram.